Do you rush into relationships only to be devastated when it ends as quickly as it began? Here are five smart reasons to NOT lean in and take your time instead. No one wants to date. Well certainly most single women looking for love don’t want to. One of the first things out a potential new client’s mouth is how she wants to meet the right man and would rather avoid dating. Okay, I get it. You think dating is not fun. You rather get on with the relationship piece and that’s what you are looking forward to. Trouble is, how can you get into relationship without DATING? Dating is inescapable if you want to find love with the right man. It’s like a right of passage. There’s no way to find “The One” without sampling some of the available single men. Truth is, I felt this exact same way myself when I was 40, still single and decided to finally DO SOMETHING about it. I told my friends I didn’t want to date, just meet my husband. I did find an adorable man who became my husband (we’ve been together happily for nearly 18 years!). But, it took 15 months and 30 men before I met him – Paul was #30. It takes TIME to get to know a man and to see if you actually are compatible or simply enjoying a heck of an infatuation. Experts and Therapists agree it takes all four seasons to know if you have a chance at lasting love. In other words, if you have two good dates, don’t start ring shopping. If you’re the kind of woman who rushes into relationships, I’m going to give you five super smart reasons to take your time and slow things down. 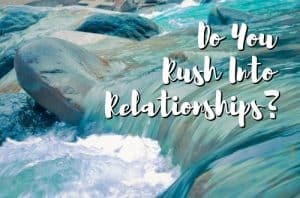 These insights will help you get clear on why rushing can ruin your chances for lasting love. Before you start planning your bright future together and picturing how wonderful it will be, take a deep breath and ask yourself, “What’s the rush?” I know when you meet a good man, you just want things to evolve quickly into everything you ever hoped for. However, rushing is not the wisest plan. There’s a book published a few years ago called Lean In. The author encourages women to go for it or “lean in”. This is great career advice, but big trouble for your love life and heart. Here’s why. Some women fall in love before they even meet the man. They have amazing texting or great phone conversations and fall in love with the idea that there’s a man out there who cares. This is human nature – the desire for love and support in a day and age when isolation has become more common than ever. Even if you’ve had a two-three dates that went amazingly well, and he seems so into you, you still have no idea who that guy is or what he really wants. Some men will do and say anything just to get you into bed one time. Others don’t know what they want, don’t want to commit, or simply need an ego boost and some female attention. There are surprisingly countless reasons why a man spends time with you but, isn’t the least bit serious and there’s only one way to find out…it takes TIME. Like 8-12 weeks with weekly dates if not more, and regular phone conversations and texting. Once you are lost in the fantasy with a new man, you are the MOST VULNERABLE TO HEARTBREAK. And then you’ll need healing and time to fully recover. You meet a man who seems like he is made to order! His looks, his charm, his sense of humor and style. Baby you’re in LOVE. You find yourself completely attached before you know much about him because you are thinking strictly with your heart (or maybe your “loins”) and not your head. The problem is, even when you start to notice red flags, it’s too late because you are ATTACHED. You have become emotionally invested with your heart set on THIS man. There’s no shaking you lose and this is how you end up with the wrong man who looked so right at the start. When you are lost in the fantasy and attached prematurely, you no longer have any sense of balance. As you rush into relationships, you don’t take time to stay in the present moment. That’s what it means when people say they are “head over heels” in love. This lovely euphemism actually means you are tumbling out of control. Then, as things go wrong, the situation becomes dire and hits you like a ton of bricks. You end up broken hearted after just a few dates, over emphasizing the impact this man has on your life. If you are panic-stricken when a man doesn’t call again after two -three dates, that’s a sure sign you are off balance. Once you decide the new guy you’re seeing is IT, you lose all hope of being objective. Should any red flags pop up, you will ignore them or make excuses for him. You willingly over-extend the kindness of the benefit of the doubt, overlooking bad behavior or poor communication. You are totally smitten and if you’re honest with yourself, you know all common sense is out the window. Your heart is in charge and you have no chance of making a decision about your future based on clear thinking. Since you didn’t want to date in the first place, the minute you connect with a decent man, you stop looking. You might stop checking emails on dating sites or apps or stop browsing for other men of interest. You rather see what happens with THIS guy and take your chances. Sadly, this choice will only hurt you. Shutting down your search before you know you’ve found “The One” is often the cause for dating a man who doesn’t meet your needs. You feel locked in thinking there are no other choices! But, that is only because you stopped looking. There are always more men to meet. The point of dating is to sort through prospects to find the right man for you. It’s not to rush into relationships with the first man who pays attention to you. That will never serve you. Learning how to slow down will help you avoid the pitfall of rushing into relationships. You won’t get lost in fantasy, become prematurely attached or off balance, lose your objectivity and shut down your options. If you truly want to find the best match, taking your time is a must. The only way to avoid heartbreak is to SLOW DOWN. You want to see that a man makes you a priority and is consistent with his time and attention over many weeks. A man needs to prove himself worthy of your love and devotion. To give your heart away before you know he’s “The One” is a surefire recipe for devastation. Dating is a balancing act, like walking the high wire in a circus act. Those well-trained performers carry a big pole to help them balance as they walk the line. That’s exactly what will help you find lasting love too. Tip the pole up or down to keep your balanced, stay in your head and not just your heart, and remain open until the right man comes along. Finding lasting love with a good man is absolutely possible. And people fall in love every day. When you stay the course, keep your options open and slow things down, your chances of ending up with the right guy dramatically increase. My hope is that you’ll give yourself this opportunity and never rush into relationships again. Lasting love with your dream man hangs in the balance. He’s out there – give him a chance. If you are serious about finding love, tend to rush into relationships and need help gaining balance in your dating life, let’s talk. Please fill out this application for a free conversation to discover how coaching can help you.